I'm not going to lie; I was insanely excited about taking a spontaneous bus trip up to Galway this last weekend. I had thrown my lot in with a group of students from UCC that I didn't know at all (to be fair, a friend had invited me to go up with them, but the friend in question came down with the flu prior to the weekend, and he had to bail – which I learned after I'd paid the deposit). So I boarded a bus of twenty-five strangers, with nothing more than a few extra shirts, toiletries, and the solid conviction that it would all work out for the best. I mean, I wasn't about to back out, despite the fact that I didn't know a soul. 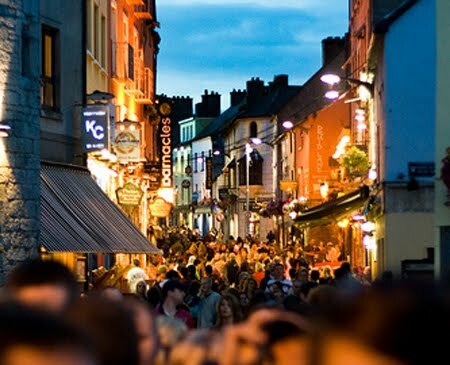 I hadn't been to Galway yet – and every time I told somebody that I was planning to go, their eyes would light up with an almost sadistic pleasure. Which probably built up my expectations more than it should have – except for the fact that I wasn't disappointed at all. Galway was fantastic. So, what does it mean to bus across Ireland with two dozen young adults and cash to burn? It means checking into a hostel centrally located on the downtown strip of the city – which is magnificent until about four in the morning, when you're trying to sleep and everyone else, newly turned out of the closing pubs and clubs, decides to hold a bit of a sing-song outside your window. I am serious – I don't think anyone actually sleeps in Galway. We were lying awake listening to drunken renditions of “Galway Girl” and “American Pie” until about five, when one of the girls in our room lost her head entirely and got in a shouting match with the guitarist from our window (the rest of us didn't stop giggling for another half an hour). It means being wooed by employees all along Shop Street and Eyre Square with astonishingly generous “concessions packages.” We don't have this in the States, but it's a tactic that Irish pubs and clubs use to snag new customers; they offer you a round of shots free, or a free bottle of champagne, to get you to come to them rather than their competitors. (Take notes, America.) Obviously, we selected one of the best offers – and, as anticipated, stayed there, buying additional pints and dancing until two in the morning. It means meeting friendly Irish men from all thirty-two counties – all extraordinarily confident in their ability to make new friends – in two of the most beautiful pubs I've ever seen in my life, The Quays and The Skeff. They were absolutely gorgeous buildings, laden with carved dark wood and stained glass and brimming with conversation, and atmosphere. I could have stayed there all night. I can't quite sum up the vibes of the weekend, but I will say this: Ireland has a reputation for having a less energetic scene than some of its European peers. People say that there's a slow, relaxed pace of life here, and that “there's not much going on, so.” Granted, this is definitely true of some of its rural areas – but I had as much fun in Galway as I have had in any major city in the States, and there was too much going on to sample in a mere two days. In conclusion: Ireland does have a party scene to be proud of. Anyone who says otherwise just hasn't tried.